When Photoshop CS6 was released, Adobe introduced Layer Filters. Over time, I have come to depend on this feature, and I really love it. But, I don’t hear people talking about it very much. So, I thought it would be nice to give a little introduction to the concept and talk about some of the ways I use it to speed up my scrapping workflow. Note: Using Layer Filters does not change what appears in your document window. You will still see the entire layout. It only changes which layers you can see in the Layers panel. However, you will not be able to click on your layout and choose a paper or element that has been excluded from the filter. While the filter is applied, you can only make changes to the layers that are included in the filter results. How Do I Make Layer Filters Work for Me? Edit Type Layers: If you have a layout with a lot of layers, it can be hard to find the one or two layers that contain text. 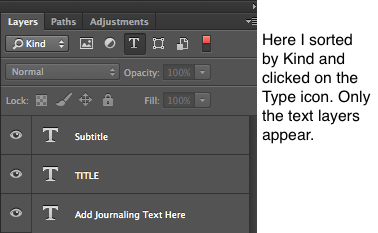 But, if you filter by Kind and click on the Type icon, only the text layers will show up in the Layers panel, and you can quickly make changes without having to scroll through all the other layers. Rasterize Shape Layers: If you’ve used a lot of Shapes in your layout and you need to rasterize the layers, filter by Kind and click on the Shape icon. Then, you can select all the Shape layers at once, right click, and choose Rasterize Layers. Done! Adjust Basic Drop Shadows: This is most useful when you’re using a template and the template designer uses a different shadow angle than you do or you simply want to apply your own drop shadow style. There are a few different ways to do this. If the template designer has marked all the paper layers with a certain color, you can filter by Color. Or, you can filter by Name and type in the word “paper.” Then, activate all the layers and apply your shadow style or make any other adjustments to all the layers at the same time. Easy peasy! Change Blend Modes: If you do a lot of blending or art journal style layouts, you probably have a lot of layers to which you’ve applied a Blend Mode. If, for example, you decide you want to change all those layers from Overlay to Soft Light, simply choose the Mode > Overlay filter. 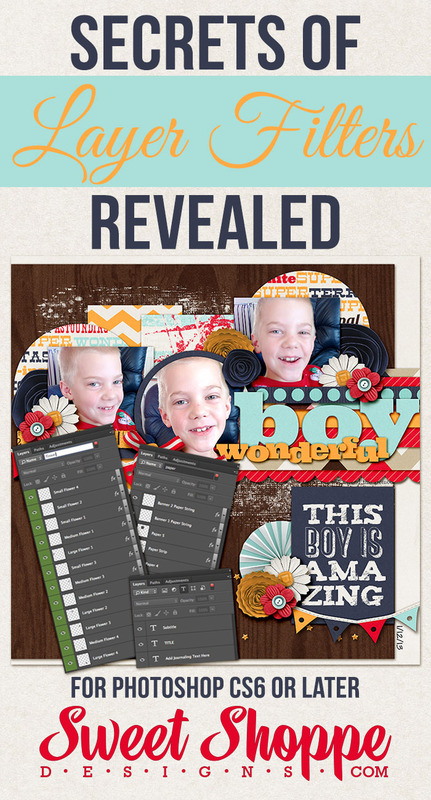 Then, you can select all those layers and change the Blend Mode of all the layers at once. 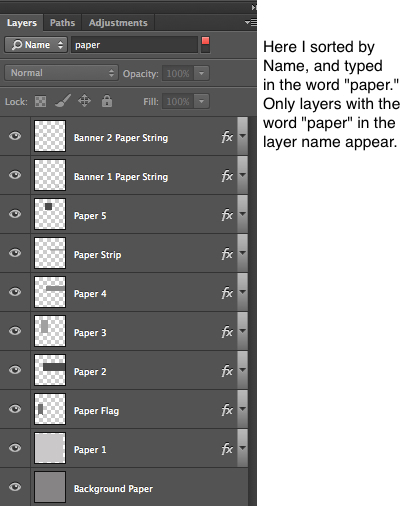 Apply Layer Masks: I often use layer masks to mask out portions of an element or paper that I don’t want to show. I like using masks because they are nondestructive, and I can go back and adjust the size and position of the mask while I am working on the layout. But, when I’m finished, I like to clean up my layers. So, I filter by Attribute > Layer Mask. Now, all I see are the layers to which I have applied a mask, and I can quickly go through and apply the masks to each layer. Delete Invisible Layers: When I have a layout almost finished, I usually have a lot of invisible layers. This happens because I experiment a lot with different papers and elements. And, rather than delete layers if I don’t use them, I just hide them in case I change my mind and decide I want to use them later. When I feel like the layout is finished, I simply filter by Attribute > Not Visible, choose all those invisible layers, and hit Delete. And, all those layers cluttering up my Layers panel are gone! I hope this tutorial has been helpful and that you’ll try using Layer Filters to speed up your scrapping workflow. You might be surprised by how useful this new tool is! man – I wish I had CS6! Sweet tut Lydia!! I feel like I’ve been asleep. Never noticed it. Thanks, Lydia. 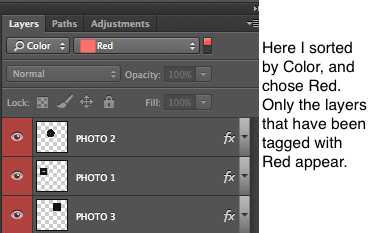 I just updated from cs3 to CC and WHOA – thanks for this awesome tip! Probably would’ve taken me months to figure it out with all the new stuff since cs3!!! !